I was extremely unmotivated this morning and decided that this whole running thing has finally played out. I've decided to quit and take up golf instead. April Fools! Fear not, I have no plans to stop, but if racing as we know it turns into this, I will reconsider it. Running through tree pollen is tough, but it's something we deal with. Running through clouds of rainbow colored corn starch is another thing altogether. Happily, there was no rainbow dust in sight this morning when I went outside for my Tuesday speed session. Due to the weather, I have been doing repeats on the treadmill. Today's weather was so perfect I wanted to go outside. I'd picked out a stretch of somewhat straight road and adopted it as my track. Due to a lack of USATF measurement resources, I had to rely on Gmaps to define my start and finish points. This lack of precision resulted in a little extra distance per run, but really, what's a tenth of mile across six repeats? My "track" has one property that is different from our local high school track: elevation change. It's not a big height difference overall, but I calculated the second half to be a 3.8% grade. Not exactly what one wants at the end of an all-out run. That's why tracks are supposed to be flat. On the other hand, the grade worked in my favor when going in the other direction. 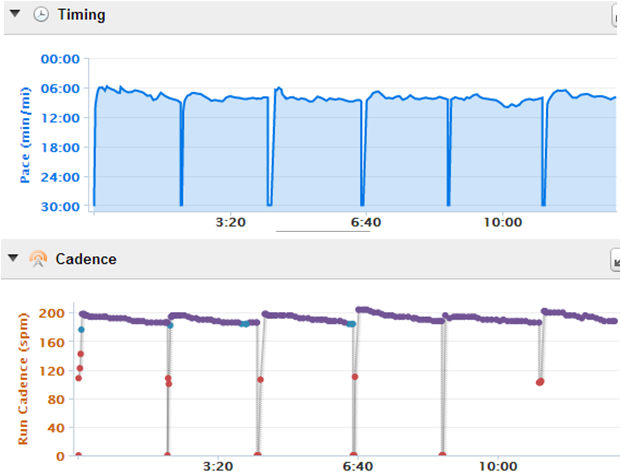 I didn't know what to expect in terms of the speed I would maintain on these intervals. Hal Higdon instructs you to run at 5K or 10K pace for this series, but I ended up running a little faster, averaging 7:56 for the set. I found that sustaining a fast pace felt easier as I moved through the repeats, although a look at the numbers showed that I slowed down a little on the last two. Cadence was highest in the first third of each repeat. Tomorrow I'm scheduled for my 5.x miles that I will do easy. I'm pleased with today's faster workout and I'm growing optimistic that the combination of performance running and base runs will prepare me well for Brooklyn. nice job! i love doing track work, but at the end of the day, it prepares you for...track racing. road intervals are great :) esp with hills. Thanks - it was the first time I ran intervals on the road and it introduced multiple variables, some helpful. As you said, the track prepares you primarily for running on flat, soft surfaces. Track repeats can help when the focus is strictly on speed. I'll be curious to see how much extra benefit I'll get from these road intervals. I dunno. I think I did track work to prepare for Baltimore which worked out great. Doing it on the roads is great, but I see nothing wrong with doing them on the track. I'm finding that doing it on the treadmill is definitely not working out for me. I have 600m workouts tomorrow, which I will do on the streets if Peter's schedule allows. Howzabout a group run this weekend? I've also found that treadmill intervals doesn't quite hit the mark, but it's better than skipping intervals entirely. I hope you can get those 600's in today. Those have to be tough. So do we have a plan for Sun?